Below are Box Office Collection Report of bollywood film 'Soorma' With his review, budget and total box office and worldwide collection status. Soorma movie lead star cast is Diljit Dosanjh, Taapsee Pannu. Soorma is an indian Biography, Sport, Drama Film of 2018, directed by Shaad Ali and produced by Sony Pictures, Deepak Singh. Soorma film Released in over 1100 screens in India and 335 screens in overseas, Total 1435 screens worldwide. 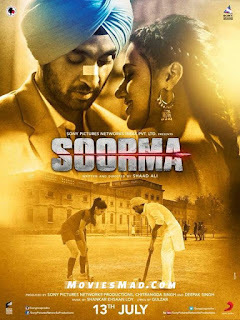 'Soorma' movie earns 3.25 crores on the first day Diljit Dosanjh might have won the audience's heart with his acting, but he was unable to give a strong opening at the box office.